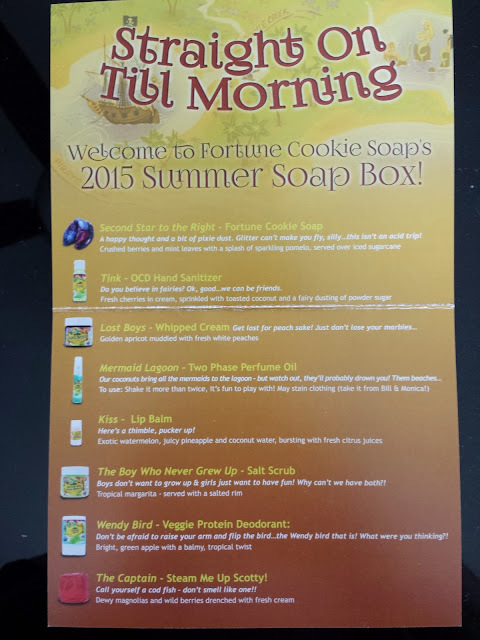 Pint-sized and Simple: Fortune Cookie Soap Summer 2015 Box "Straight On Till Morning"
Fortune Cookie Soap Summer 2015 Box "Straight On Till Morning"
Sooo I think I may have a slight hoarding problem, especially when it comes to bath & body products. I keep collecting samples of soaps and lotions and everything in between but I never use them and I don't know why. I think maybe it's because those tiny little jars are just so darn cute. I'm that person who will keep an empty container for years just because it has a cute label on it. I still have the unused body wash from the spring Fortune Cookie Soap box in my closet and it took every ounce of willpower in me to get myself to finally use the bath tea last week (it didn't work. I think I was better off using it as potpourri; plus it would have lasted longer). Fun fact: Each box comes with a $10 code to use in the upcoming product launch! Now here I am with the next FCS box. 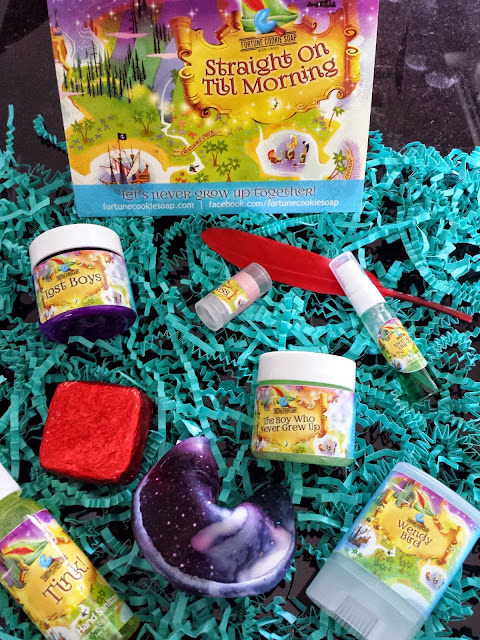 It seems like we haven't quite left fantasy land after spring's Alice in Wonderland theme -- summer's "Straight On Till Morning" box has everything to do with Peter Pan. Let's see what kind of adventures await us, shall we? Lost Boys Whipped Cream - golden apricot muddled with fresh white peaches. This sounds yummy, unfortunately it doesn't smell like it sounds. I've learned to love peach scents thanks to K-beauty, but I couldn't pick up on anything peach about it. Or apricot, for that matter. I actually think this smells like a car air freshener called "cool breeze" or "crisp waterfall" or something to that effect. It's not a bad scent, but it's not very masculine and I highly doubt the Lost Boys of Neverland would want to smell like this. Tink! OCD Hand Sanitizer - fresh cherries in cream, sprinkled with toasted coconut and a fairy dusting of powder sugar. This sounds like a very sweet and rich scent and something right up my alley. I do smell the cherries and cream on the dry down (and it smells DELISH), but no sugar or coconut here. I think I'd like this better if it were in a different form, maybe lip balm or whipped cream or something that I use more than hand sanitizer. There are tiny flecks of glitter in here that get all over you when rubbing it into your hands. I don't know why they added glitter because I find it annoying, but I think it might be an FCS thing; the last bottle of sanitizer I got also had glitter in it. The Boy Who Never Grew Up Salt Scrub - tropical margarita - served with a salted rim. Interesting scent, but it doesn't smell like margarita. When I think of margaritas I think of something tart and sweet at the same time. This scrub doesn't smell tart at all. I can't quite put it into words, but the phrase "green apple body wash" comes to mind. It also smells a teeny tiny bit like Spree candy. Is that too descriptive? This takes me back to my preschool days for some reason. I think my classroom may have smelled like this. Or maybe it was my teacher. Who knows, I was three. Well at least it lives up to its name - this makes my mind feel as if it never grew up. Kiss Lip Balm - exotic watermelon, juicy pineapple and coconut water, bursting with fresh citrus juices. Mmm talk about mouth watering. This is a tiny sample about an inch tall that I am certain I will lose within the week. I like when lip balms have some flavor to them, and FCS did not disappoint. The balm itself feels highly moisturizing thanks to coconut oil, beeswax, shea butter, cocoa butter, and vitamin E. But what impressed me even more is that it actually tastes like citrus and maybe a bit of watermelon. It's untinted so you can even wear it under lipstick if you wanted to. Second Star to the Right Fortune Cookie Soap - crushed berries and mint leaves with a splash of sparkling pomelo, served over iced sugarcane. Each box comes with the namesake soap shaped like a fortune cookie (there's even a fortune inside too). I have yet to use one because I don't use solid soaps very often. They last forever and I usually end up getting tired of the scent before it's used up. I can't say much about this one except that it smells like soap. 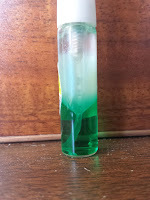 Not like the Dial or Irish Spring bar soaps, but imagine if they made gel deodorant into a soap. I think it would smell like this. The Captain Steam Me Up Scotty! - dewy magnolias and wild berries drenched with fresh cream. Every time I read the word "cream" I imagine something sweet. This soap is like a perfume. It has floral top notes followed by a subtle sweetness of berries. Then the cream is apparent in the...aftersmell? I think I just did a terrible job describing this but all I know is I like it. If it smells as good in the shower as it does right now I may have to get more. And that's saying a lot because I normally don't even like florals. Thanks, Captain Hook! 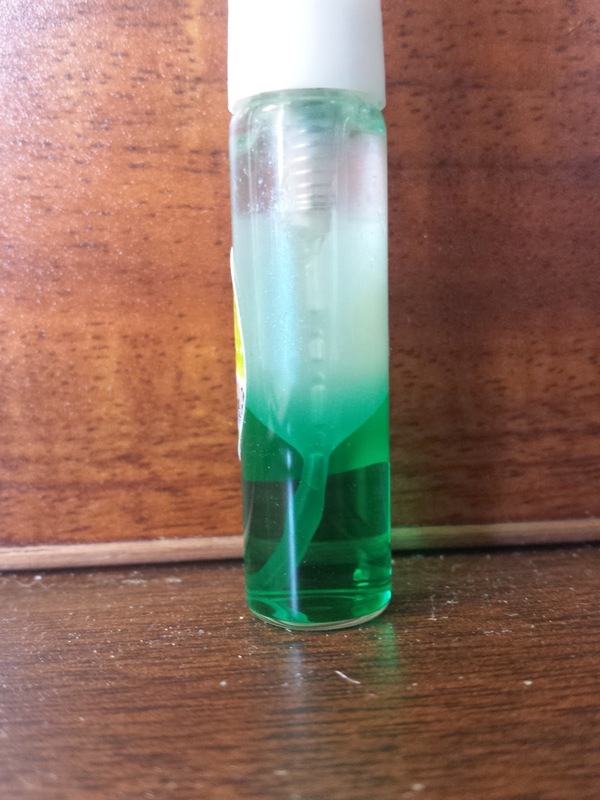 Mermaid Lagoon Two Phase Perfume Oil - There's no scent description for this one on the info card but I'd say this smells like someone accidentally dipped a graham cracker in aftershave. Wait. Not dipped, soaked. I can't even smell the spiciness anymore; all I smell is a masculine scent. It's giving me a headache. Those poor mermaids. On the upside, this is kinda cool to look at. The oil and fragrance separate out so you have to shake it before using it. I'm easily amused so I'm having a blast just shaking it and watching it separate over and over again. Word of warning: this stains clothes according to the info card. 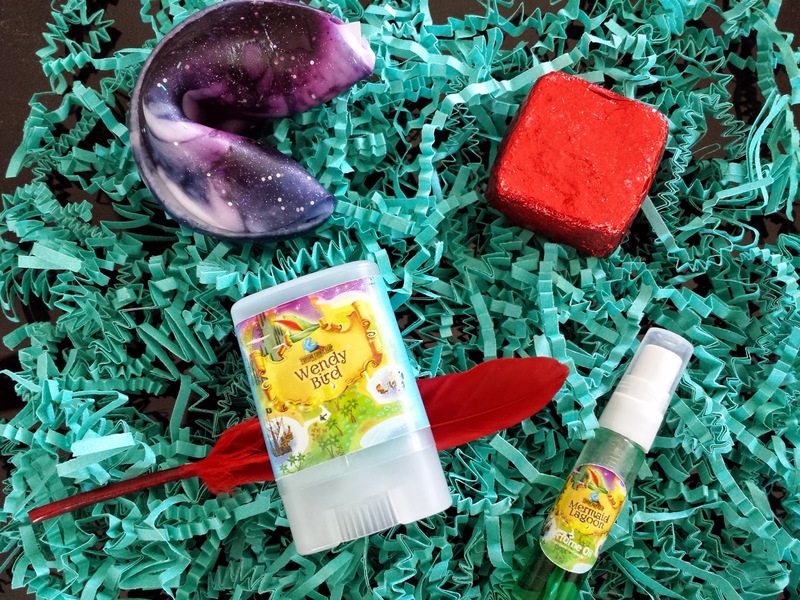 Wendy Bird Veggie Protein Deodorant - bright, green apple with a balmy, tropical twist. What a fresh scent. And it actually smells like the description. This is about the size of a Zippo and would fit easily into your purse. I am one of those people who leaves the house on the spur of the moment to grab groceries only to realize once I reach the parking lot that I forgot to put on deodorant. I've since learned to keep a full-sized stick in my bag for emergencies but it's pretty bulky and my bf looks at me funny when I dig around for my keys and pull out a stick of deodorant instead. This is more discreet, not to mention it smells a lot fresher than baby powder + flowers. So I can see myself using three, maybe four of the things in the summer soap box. I'm kind of disappointed that a lot of these scents were completely different than the descriptions (to me anyway). I think my favorite thing in here is the deodorant because it's practical and it smells so clean. My least fave would have to be the perfume oil. It smells nothing like lagoons or mermaids (as if I know what a mermaid smells like) and it's way too strong for me. Maybe that's how mermen smell? In that case I'm glad my bf is not a merman. Note: I paid for this box and everything in this post are mine and my nose's honest opinions. Okay, I'm so with you on the descriptions. I did not think any of them really smelled like they were supposed to. I didn't smell coconut anywhere and I love coconut! I'm also like you. My FCS stuff tends to pile up. :\ I've discovered I will use the hand sanitizers, room sprays, steam me up's and lip balms but that's about it.